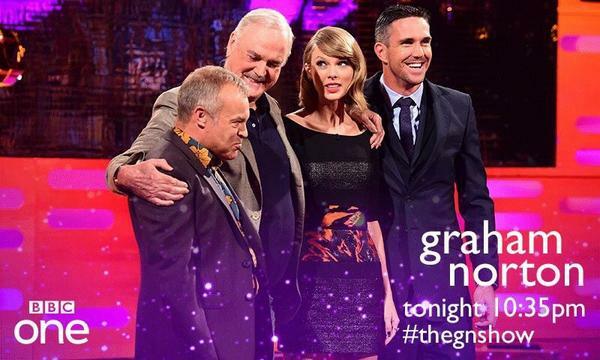 Taylor Swift on The Graham Norton Show! You know what I mean. There’s lots of talk shows out there, but you know which ones are actually going to be fun. Here at the Swift Agency, just a guy who never takes himself too seriously, we really enjoy The Graham Norton Show. First off the bat, we get 1989 secret session talk. Taylor is not a stalker, people. You just don’t know how the Taylor Nation operates (we are actually nice). I am a Monty Python fan, but even I think John Cleese put his foot in his mouth on this one. Uhhh, we don’t want to do that, John. Also, when Kevin Pietersen reveals he’s allergic to cats, how many people know that Taylor took some distance because she’s actually around cats all the time?